Do you want to score the new Realme 3 at discounted price? Well, this news is for you! The device will be available on Shopee starting on March 25. And as a treat, Shopee will hold a flash sale where consumers can get the device for only Php6,290. 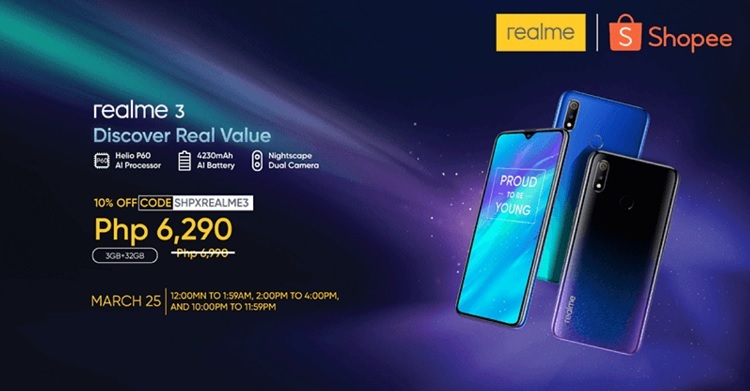 Originally priced at just Php6,990, Shopee will offer the Realme 3 (3GB/32GB) variant for a more affordable price tag during its flash sale. Here are the Realme 3 flash sale schedules on March 25: 12MN to 1:59AM, 2PM to 4PM, and 10PM to 11:59PM. To enjoy the promo, you simply have to use the SHPXREALME3 code. Meanwhile, its 3GB/64GB and 4GB/64GB models will be up for pre-order beginning March 30.